Amares is located in the northern region of Minho between the historical city of Braga and one of Portugal's finest nature reserves, the Peneda Geres. It is definitely an area that is not as well known to tourists but for this very reason it is an ideal retreat for those who want to steer away from the usual crowds. 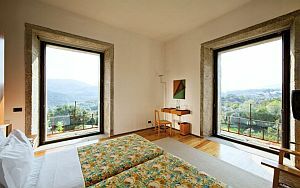 With its very own Pousada this is a marvellous place to base yourself while you explore the area. Formerly a 12th century Cistercian monastery, it was converted into a luxury hotel and has won many awards for its excellent restoration. The Pousada de Amares (Hotel Santa Maria Do Bouro) also has its own swimming pool and an excellent restaurant. From here you can enjoy several interesting day trips. Just south west of Amares, and only 15 km away, is the city of Braga one of the largest in Portugal with a very historical background. Its 7th century Cathedral is the oldest in the country and has a stunning interior. This is also where the tomb of the first king rests, Afonso Henriques. During the 11th century Braga became the home for Portugal's Bishops and has several beautiful palaces. Some of its main attractions include the Municipal Library which used to be the Archbishop's palace, the historical Town Hall, and the Palacio do Raio. There are also some fascinating museums with exhibits of period furniture and an incredible collection of over a hundred thousand glass photo negatives. On the hillside overlooking Braga is one of the Portugal's most famous attractions, the church of Born Jesus de Monte. There is a rather unusual staircase that is quite a climb to the top. For those who are not quite up for that, there is an antique funicular that was built in 1882 to take visitors up to the top which still operates today. Behind the church are three unique chapels each representing a period of Christ's journey. There are certainly plenty of activities to enjoy in this area as well. To mention just a few, there is hunting, fishing, horseback riding, cycling tours and water sports. However, for those who enjoy hiking, the Peneda Geres National Reserve is extremely popular, and located just north east of Amares. The park is a wonderful mixture of forest, valleys and granite rocks that date back 300 million years. It is also home to a variety of wildlife from wolves, wild boar and deer to a huge number of birds. The park's most famous inhabitants though are the wild Garrano ponies which have roamed this region since the Celtic era. The Geres Mountain within the park is also protected, with spectacular waterfalls, lagoons, fabulous viewpoints, and beautiful fauna and flora. Spring is therefore the best time to go if you want to see all the flowers in bloom. The Peneda Geres Nature Reserve will also be of great interest to those who want to see historical ruins as there are many with the park. There are Celtic fortifications, megalithic stone tombs dating back to 3AD, and a well preserved Roman road built in 1AD. 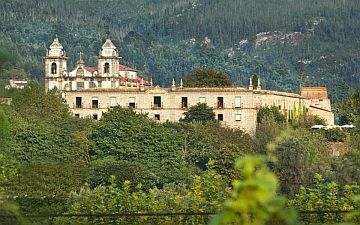 There are also castles and monasteries such as the 10th century Castro Laboreiro and the 9th century Santa Maria dos Pintoes. Another wonderful aspect of this area is the famous Vinho Verde wine. Originally only produced for domestic consumption, exportation of this wine began in the 12th century. However, the introduction of maize during the 16th century meant new regulations were brought in to maximise its production. This forced the grape growers to drape the vines over the trees and hedges to allow more room for the maize crops. Hence the vines had to be picked from tall ladders. Ironically they discovered this actually protected the vines from rot which they tended to be susceptible to because of the high rainfall. Wine production has continued to thrive ever since, and today visitors can enjoy sampling these fine local wines whilst enjoying some unique accommodation and excellent cuisine at the Pousada de Amares.